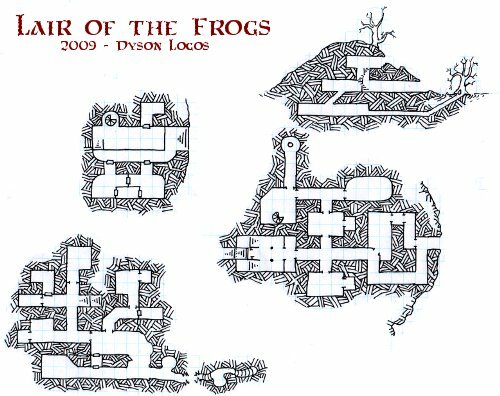 One of the first maps I posted to the blog was the Lair of the Frogs. Unfortunately I have long ago lost the original drawing of the map, as well as the hard drive that had the only high resolution scan of it (back then I was posting low resolution scans to the blog with the eventual hope of publishing a book with the high resolution versions). So I elected to take another stab at the map and see what could be done in an isometric perspective. The end result isn’t great, but at least it is in a higher resolution, right? After a clumsy and abortive failure at destroying the Temple of the Frog in old Blackmoor that ended in a near TPK and the one survivor leaving the region to find work as a short-order cook (seriously! ), the frog-like humanoids and their giant frog companions became something of a nuissance critter in one campaign. The Lair of the Frogs was a low-level adventure to launch a new campaign for those same players that flubbed the Temple of the Frog. It’s an old hill fortress and temple that has been long abandonned and now taken over by the frogs. The upper level is mostly abandonned, even by the frogs, except as a guard post (most of the guards end up being more concerned with catching flies and entertaining themselves than actually watching for people approaching the main entrance to the temple. The main level of the temple is lived in by the lowest-ranking of the frogs. It’s the lower level, accessible through the main level or through the secret entrance in the roots of a rotted-out tree in the swamp that contains a majority of the frogs. The lower level is very damp and nasty, and the doors have either rotted away or are stuck so firmly that the frogs can’t be bothered to open them. 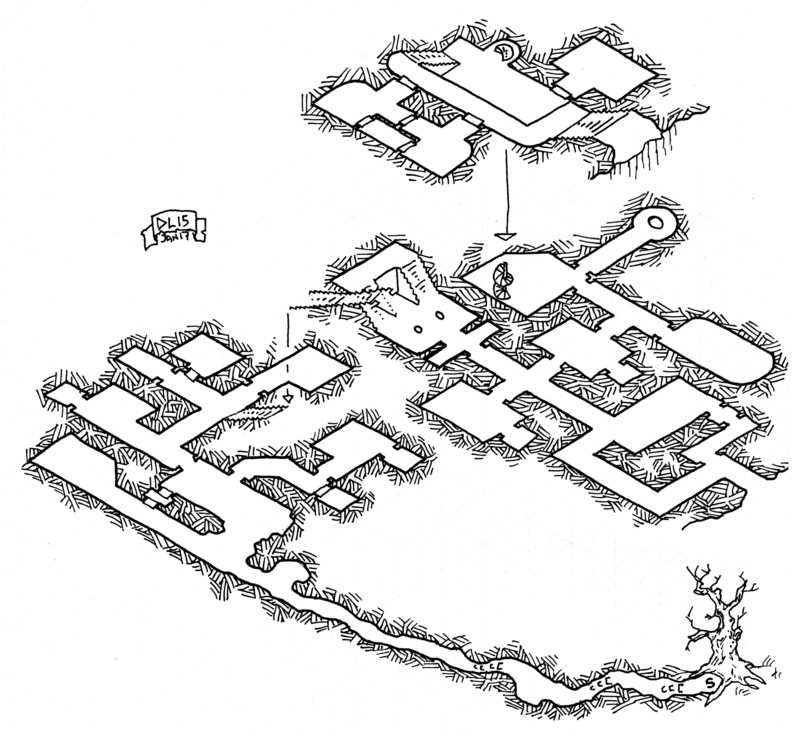 In the original adventure here, the frogs were keeping their prisoners on the ground level of the temple (near the well room in the North West corner of that level), so the party didn’t have to go into the heart of the frog-infested basement. The side view of the first version of the map is still important to make full sense out of this version of the map, and I realize that I should have reproduced it in the new version. In the end, I’m not all that happy with this remake. I think the lesson in this for me is to not go back to maps I’ve already drawn and try to remake them, but instead to keep striving forward. 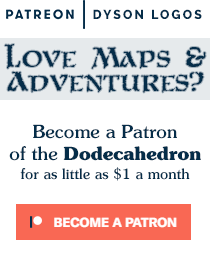 This map is available to you for free for personal use thanks to the awesome patrons of the Dodecahedron Patreon Campaign. The awesome outpouring of support from Kyle Maxwell, Jeff, Jesse Butler, Wayne’s Books and over 200 other amazing patrons keeps these maps flowing for your use. If you do find a use for one of these maps in your games, I would love to hear about it! I actually really like the isometric version of the map and think it reads just fine without the side view or previous map. Great work as always! Thank you for sharing this with the world. The landing over the stairs down to the bottom level is much clearer in the iso. Were I too redo that part, though, I would probably make the foreground stairs going up solid since the viewer can see the stairs going down. I’ve been toying with your “Lair of the Frogs” original map & I’m nearly finished with stocking it and being done with it for a 5e campaign. As of this writing, I only have about 4 areas left to detail and it will be done. If anyone (Dyson? Dyson?) is still paying attention to these old blog posts & replies, once its finished, I’ll post it at my blogspot: http://primereq.blogspot.com/. Oh, and thanks for the wonderful maps, Dyson!